Erde 60cm high waterproof trailer covers are a popular accessory as they are less expensive and easier to fit than a hardtop cover. These high covers are made from a thick waterproof material that is tailored to fit any trailer from the Erde ‘leisure’ or ‘commercial’ range. studs on the outside of your trailer. These bungee cables keep the cover firmly attached to the trailer, but unfortunately there is no way to lock this style of cover. Overall, this is an easy to use and versatile cover that can stop the weather from getting into your trailer. 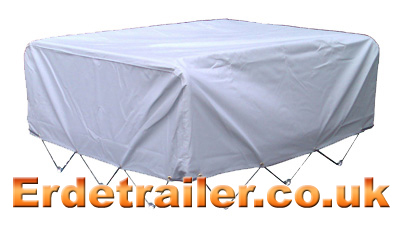 60cm High waterproof covers are available for trailer models 143 and above.